GPI-2 is an API for the development of scalable, asynchronous and fault tolerant parallel applications. GPI-2 aims at high performance, delivering wire-speed from the interconnect. It relies on one-sided and asynchronous communication that allow a perfect overlap between computation and communication. See some results. A scalable solver library for sparse linear systems based on GPI-2. System reliability is increasingly important to applications that aim at execution on hundreds of thousands of cores. GPI-2 offers mechanisms that allow applications to react to failures and continue its execution. 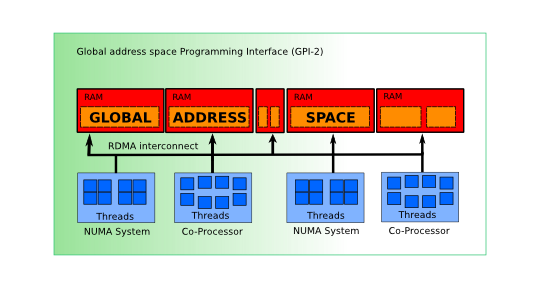 GPI CP is an open-source In-Memory Checkpointing Library. GPI-2 is an open source implementation of the GASPI standard and freely available to application developers and researchers. Go to the Download section to obtain GPI-2. For commercial users we offer a comercial license and support. Contact us!